Mysteries of History: Mapmakers and Jigsaw Puzzles ~ The History Girl! London, England, and the year 1767, all have in common? Spilsbury had a wild idea of mounting one of his maps of Europe to a sheet of hardwood and then cut around the boundaries of each country. The result was an educational aid to teach children about geography. The combined idea of learning and recreation turned this new concept into an effective tool. These early versions of puzzles were not cheap. They cost as much, if not more than a week's pay (10 shillings each). Unlike the puzzles of today, these did not have interlocking pieces. The pieces were made from mahogany or cedar, hand cut, and were commercially sold to the English Socialites for their house parties. The weekend house guests would continuously work on the puzzle that was left in a common area, and would be completed by Sunday night before the guests left. 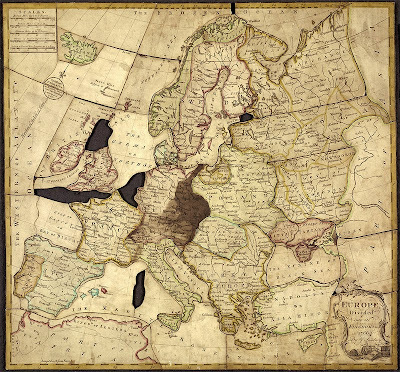 John Spilsbury's 1766 Puzzle of Europe. By the 1870s, with the invention of the jigsaw, manufacturers were now able to cut the wood into more intricate pieces. The use of plywood also evolved with this new cutting style. Early producers of the puzzle glued their pictures onto the wood, and then penciled the underside for random cut patterns. Evidence of this process can be found on the older puzzle pieces of this era. 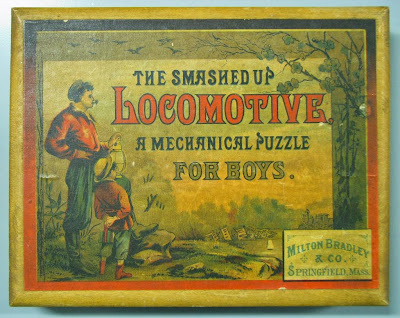 In 1880, Milton Bradley made the first jigsaw puzzle for children - "The Smashed Up Locomotive." By printing a lithograph of a steam engine locomotive and cutting it into pieces, the "smashed up" effect was achieved when a child opened the box and saw the locomotive all in pieces. Because of his Puritan upbringing, Bradley's nature was to seek order. Therefore, the object of the "The Smashed Up Locomotive" was to make the locomotive whole once again. By the turn of the twentieth century, puzzle manufacturers began to use cardboard for the pieces. This style of puzzle was of poor quality, but the popularity for this amazing new pastime grew rapidly. Now the price per unit became more affordable for the average household. Most puzzles were a mystery, because no picture of the finished product was supplied. Nevertheless, once assembled, the sense of completion was overwhelming. 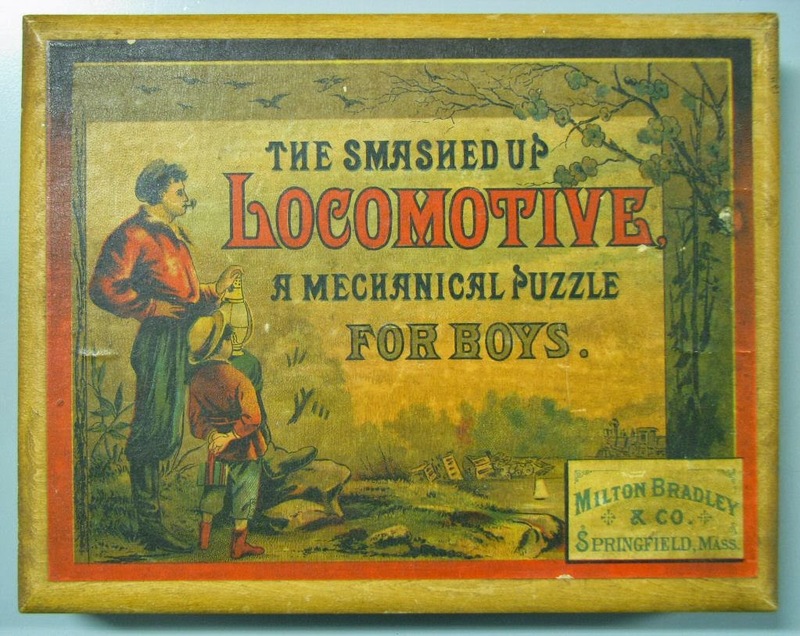 Milton Bradley's 1880 Smashed up Locomotive Puzzle. Modern day puzzles are produced to target certain audiences. For instance, large pieces with simple colors are for young children and much more elaborate cuts and color patterns are for adults. The use of die cutting machines for mass production, made the puzzle available for everyone to enjoy. From what started as a simple concept, over 250 years ago, is now available in many forms. Double-sided puzzles, 3-D puzzles, and still the puzzle master favorite, the mystery puzzle with the picture still unknown until completion. Whether it is on a snowy winter’s afternoon in front of a log fire or a cloudless summer’s day sitting in the garden, the jigsaw puzzle is a wonderful form of relaxation.